Chris Kutarna explains why we are in the midst of a second Renaissance. Some 500 years ago, Johannes Gutenberg, Nicolaus Copernicus, Michelangelo and others were part of the Renaissance, a time of significant cultural change. Now, authors Ian Goldin and Chris Kutarna say we are in the midst of a second Renaissance. 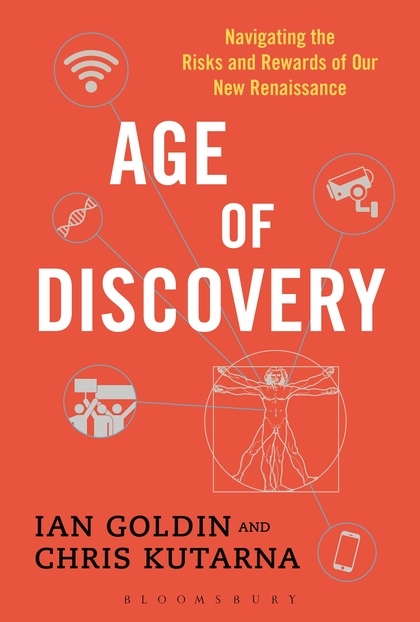 Kutarna stopped by the Knowledge@Wharton Show on Sirius XM channel 111 to talk about their book, Age of Discovery: Navigating the Risks and Rewards of Our New Renaissance. Knowledge@Wharton: What are some of the key ingredients that you think indicate we could be headed for a second Renaissance? Kutarna: In the big picture, we boil it down to three things: new maps, new media, and a new human condition, which are the three very broad parallels that reshaped the European society 500 years ago and are reshaping our world today. Five hundred years ago a man named Johannes Gutenberg brings the printing press to Europe. It suddenly flips the economics of information exchange and knowledge creation, and that had enormous implications — not only to accelerate science and technology, but also to give new power to extremist movements, like the Bonfire of the Vanities that a man named [Girolamo] Savonarola ignited to rip control of Florence from the establishment, the Medici, and put his own populist agenda in power…. When there is widespread social discontent and a new technology available to give that discontent a powerful voice and bind together the people who feel the same way, we just can’t take the status quo for granted anymore…. Knowledge@Wharton: How do you think DaVinci and Michelangelo would navigate the situation today? It was a very strange thing to say because it seemed very counterintuitive. The more fraught with risk our environment becomes, the more we want to hesitate, to press pause, to wait and see how things are going to fall out. Machiavelli told all of his peers, “No, no, no, that instinct is exactly backward.” Because in a time of rapid change, whatever our present habits are, they are rapidly becoming outdated, ill-suited to the time we live in, even dangerous to maintain. It’s bold action, it’s impetuous action, that shows the rest of us, what’s the new way of doing things, right? What’s the new wisdom that operates better in the time we live in? And so we need to continue to take risks, to reset our expectations, and reset our basic habits of action so that we don’t just get left behind by the world that is changing around us. Knowledge@Wharton: The digital realm has come in so fast and so strong that a lot of people don’t even remember what it was like before. Kurtana: That’s right. For me, that is a perfect example that we are not in an ordinary time. We are living in extraordinary times. Within 25 years, the basic structure of our global economy, our politics — you think of the fall of the Berlin Wall, the end of the Cold War, the reintroduction of China into a global economic system — has reshaped the world. So those are the new maps. But also the new media, computers, digitization, social media, have so completely reshaped the world that we live in. Can you remember a time when if you wanted to share your photographs from the vacation with your friends, that the only way to do that was to order a second set of prints, and mail them? I do remember that, but very vaguely. Or that I had to go to the public library to look up the capital of a country I didn’t know. More than half of us remember that time very well, but that world is gone, and it’s never coming back. Knowledge@Wharton: Think about the concept of the scrapbook. Probably nobody under the age of 30 understands what a scrapbook is today. Kurtana: That’s brilliant, but you know what? In 15 years, it’s going to be the biggest thing. Something else that is interesting and maybe comforting to older generations is that while technologies change, and circumstances change, human nature actually remains pretty stable through the generations. That’s partly why it is possible to look back 500 years, understand how people dealt with the time they lived in then, and bring some reliable wisdom forward. Although the technology environment has completely changed, humans, our nature, our interests, what deeply drives us, still more or less the same. So things like scrapbooking, the nostalgia for the past, the joy of collecting pieces together and putting them into some tangible forms, there’s something deep within us that enjoys that. In 20 or 30 years, when everyone is diffused in this digital age, there’s going to be some trend that says, look at how they used to do this, and wasn’t this amazing? People are going to start to pick it up and realize that there are some deep things that are satisfying and valuable about interacting with physical stuff, objects, and suddenly it will become a trend again. Knowledge@Wharton: You talk a little bit about education in the book as well, and the opportunities that we have in that realm. Obviously that is a very important piece to where we’re going to go over the next 50 years. Kurtana: One of the things that my co-author and I consistently say, and it takes more and more courage to say it, especially as you look at the headlines, but in the big picture, now is the best time in history to be alive. [This is] basically an assertion based on the big macro-stats of health, wealth, but also education. Because of the enormous expansion of higher education in places like China and India, there are more people alive right now with a higher education degree than all university degrees awarded in history prior to 1980. It is extraordinary. There are 3.5 billion more literate people alive today than 25 years ago. Virtually the incoming generation of adults is going to be literate, which means 90% of humanity is going to be able to plug into the new knowledge and information networks that we’ve created. Throughout human history, information has always been our most precious resource, always. It always comes down to information in the end.